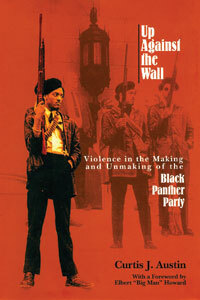 Up Against the Wall chronicles how violence brought about the founding of the Black Panther Party in 1966 by Huey P. Newton and Bobby Seale, dominated its policies and brought about the party’s destruction. Austin shows how the party’s early emphasis in the 1960s on self-defense, though sorely needed in black communities at the time, left it open to mischaracterization, infiltration and devastation by local, state and federal police forces and government agencies. He carefully highlights the internal tension between advocates of a more radical position than the Panthers took, who insisted on military confrontation with the state and those, such as Newton and David Hilliard, who believed in making community organizing and alliance-building their first priorities. Austin interviewed a number of party members who had heretofore remained silent. With the help of these stories, Austin is able to put the violent history of the party in perspective and show that the “survival” programs such as the Free Breakfast for Children Program and the Free Health Clinics helped the black communities they served to recognize their own bases of power and ability to save themselves.